How to Establish Standard Time (SMV) Using PMTS Codes? In garment manufacturing, the sewing standard time is a primary measure for many things including garment costing, manpower and machine planning, line setup, performance measuring and benchmarking. When it comes for establishing the standard time for an operation, engineers trust the SAM generated using a PMTS software, where the PMTS codes are primarily used for deriving the standard time based on the motion sequence following doing an operation. 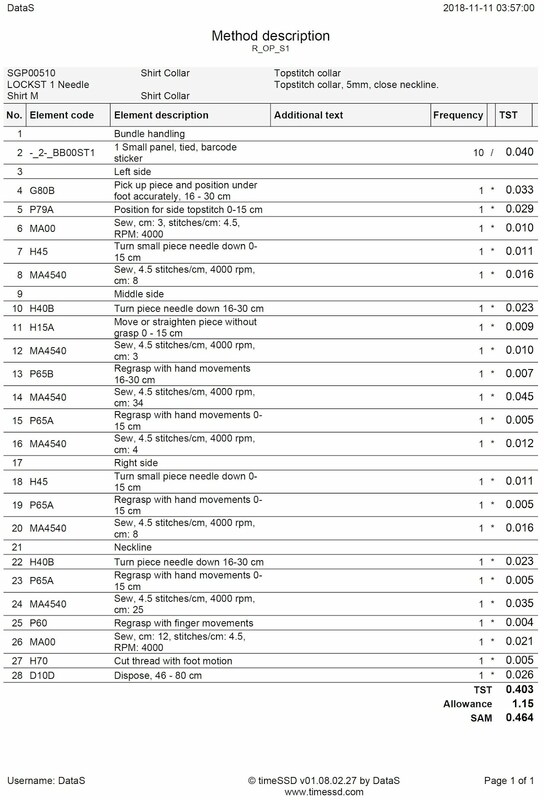 Do you know how the operation SAM is calculated/established using the PMTS codes? In this post, Laszlo Szabo of timeSSD® will describe how the SAM is established using PMTS codes. Is it enough that established time to perform all necessary tasks? What kind of tools are required to be ready at that time? The scope of the questions is to be convinced that the time dedicated to the well-defined tasks is a “right” one for all involved parties, meaning that it’s a “standard”. For the RMG industry, as a labour-intensive sector, are indispensable the standard times from all business aspects: planning, performing, tracking, costing. The industrial engineers are that professionals who hold the required know-how to establish the standard time for a defined job sequence (method). 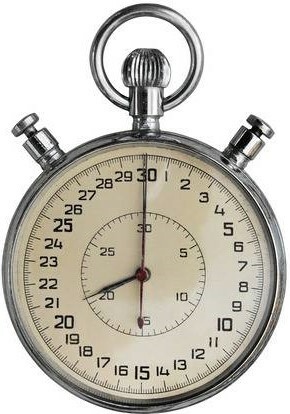 During the old times the stop-watch, observation criteria’s and established iterations were the common procedure*. To get an accurate time using a chronometer, with acceptable tolerance, is a time- consuming activity. Additional weaknesses of it are the very summary description of the execution steps and minor attention for the possible workplace improvements. The PMTS (Pre-determined Motion Time Systems) is the natural answer to the deficiencies of the manual methods. MTM-2 (Method Time Measurement 2) is that generic family of PMTS which classify the motions according to what they look like to an observer and with its reduced number of codes – but respecting a low tolerance level – speeds up the definition process. A step forward is the dedicated PMTS where are defined ready-to-use motion elements for the specific industry. timeSSD® is a PMTS dedicated for the RMG sector with MTM-2 based ready to use standard motion elements, offering celerity in labor content evaluation. The predefined standard elements are grouped in three, industry dedicated, Classes. Each Class is divided into groups for fast and easy localization of the Element sought, by clicks. For each possible motion in the sewing, line exists in the SSD Class a predefined element with its standard execution time. The SWD Class includes the hand movement, weightlifting, move-walk, read-write elements. Finishing and inspection job motions has their predefined macro-elements in the SFD Class. The timeSSD software offers two additional Classes to provide in an easy manner the solution for any unforeseen case. The MTM2 Class includes the MTM-2 data table with all of its basic elements and standard times. In case of no found the necessary predefined element in the three dedicated Classes the user has at its disposal the MTM-2 motion elements to build it up. For the repetitive user-defined elements, the software allows creating Own Classes where the own elements could be stored. They could be stored in a structured format and they are available only for the group of users belonging to the same Business account. It’s a repetitive question addressed. The user has several ways to check the accuracy of the element times. Starting from the chronometer-based procedure until to build up the predefined element from MTM-2 motions, the data table is included in the software. Can be an argument the use of the timeSSD® elements database by over 800 companies (all together with the former SSD version). The MTM-2 elements have a proved high accuracy. The timeSSD® predefined elements use the MTM-2 motion set. The times provided by timeSSD® are always accurate for the method defined by the user, the time is standard for that method. This means that the time provided for a method is so right for a task as how right is the method defined by the user for that task. The user should master the concept of the motion analysis, the software provides the accurate times for the selected motion elements without the capability to decide if the selected motion is the right one or not. Extra and only in principle: the user expected accuracy should fit his work accuracy and fit with the company’s general data accuracy. 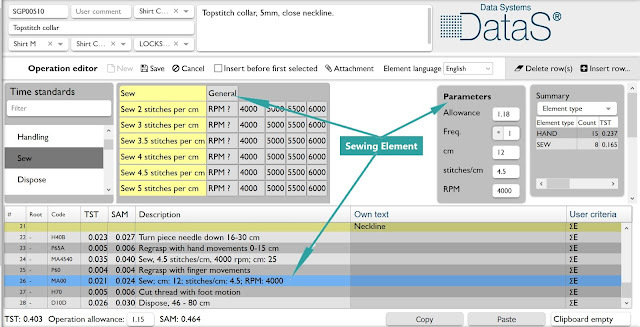 The SMV of a sewing operation is the sum of the standard times of the motion elements necessary to perform the operation with the predefined method, plus the corresponding allowance. The user follows the operation video and selects with mouse clicks the observed motion’s corresponding element from the easy to use element matrix. By the selection, the element’s description and standard time are inserted in the working method’s list. 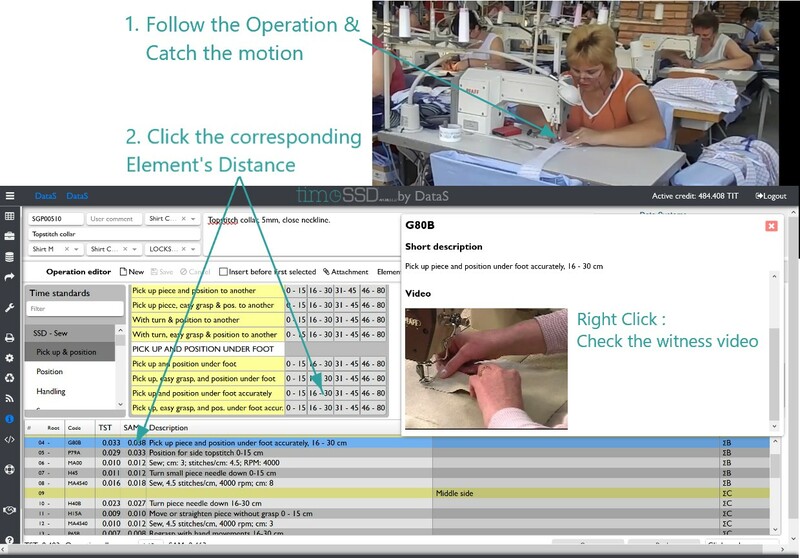 With right click on the element, the motion’s witness video is shown. The allowance can be set on element level and on operation level, too. The sewing element’s standard time includes the acceleration and deceleration of the machine. 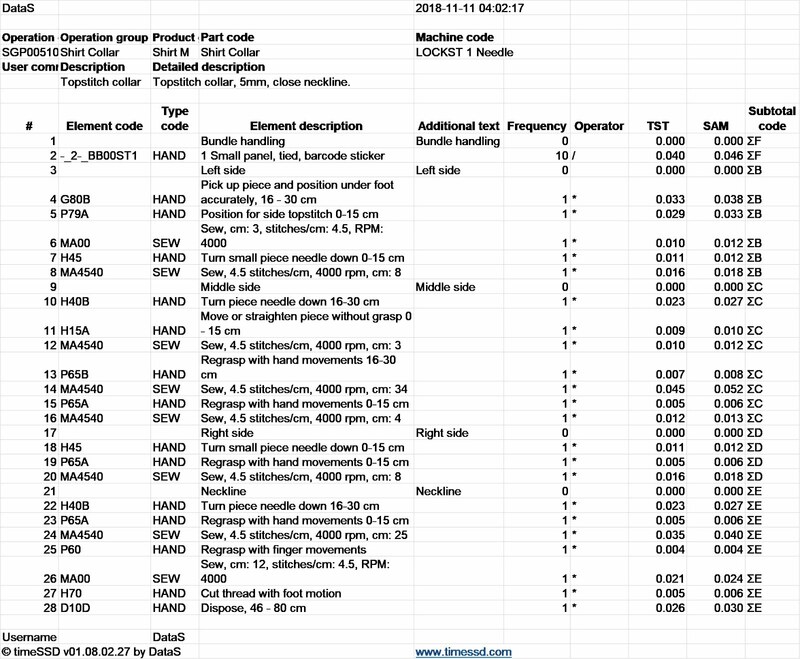 The machine parameters (rotation, stitches per centimeter) can be set together with the sewing length. The operation’s standard time is always shown on the bottom of the page. It’s updated on an event of any parameter or element change. 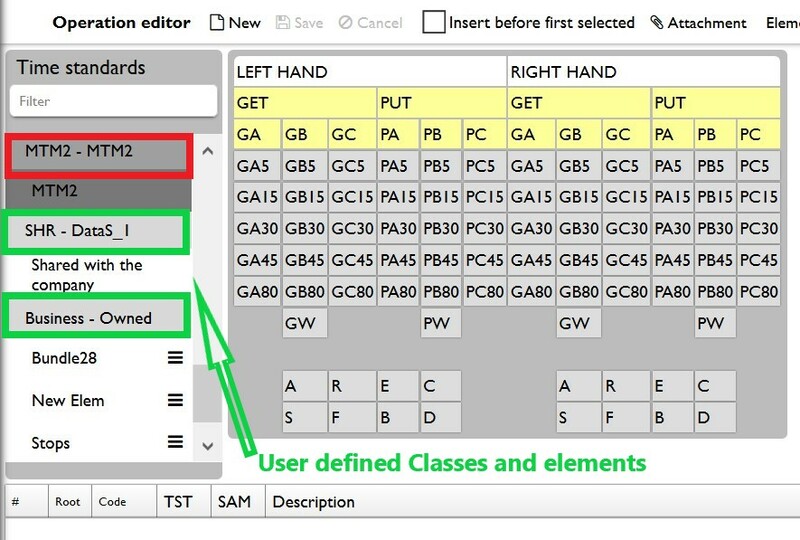 In the “Summary” window the user can follow the proportion between the handing and sewing elements, both in times and percentage. timeSSD offers celerity, an experienced user needs between 12-20 minutes for the analysis and edit of one-minute work. Once the method is defined as the ordered motion elements list then it’s available for printing, Excel export, sharing with partners and transfer to the shop floor control system. The novelty approach with “pay per use” pricing and the transparency provided by the embedded share feature makes the timeSSD® the real cost-effective solution, defining a new paradigm in PMTS. *Still exist reference manufacturing units which don’t want to acknowledge the progress. Is it ignorance or negligence? 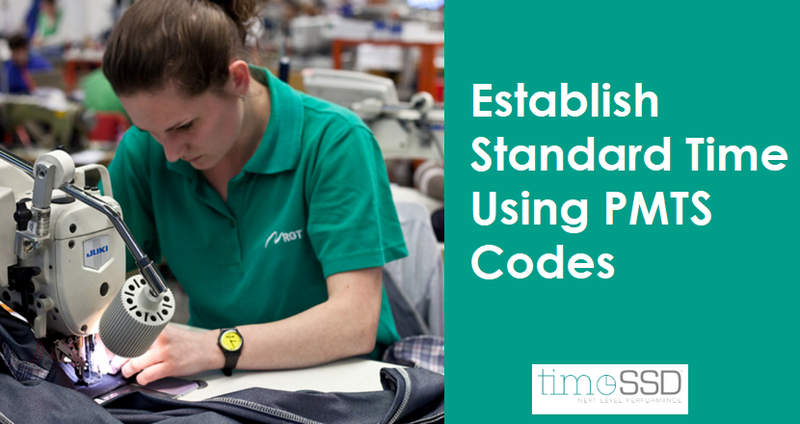 Online Clothing Study: How to Establish Standard Time (SMV) Using PMTS Codes? Calculate garment operation SMV using PMTS (MTM2) software. Step for deriving standard time using timeSSD and PMTS codes.